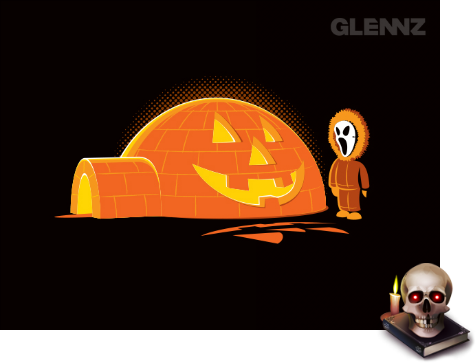 no mas pantalones: Glennz Tees "Northern Haunting"
Two years ago, the scene depicted in Glennz Tees' "Northern Haunting" would have been more than fitting for the Northeast section of the United States, as trick-or-treating was seriously affected by a huge snowstorm. I'm all about the snow and snowboarding, but not when it puts a damper on my favorite holiday. Stupid storm damaged about a dozen foam tombstones in my front yard! The "Scream" mask and reflection thrown on the ground are nice little flourishes that really top off an already clever and well done illustration.